Another month has nearly finished and I have completed the third page of my 2010 BJP. This one is attributed to Maree, a friend who has widened my music taste so it now includes things like malfunkshun, kings of leon and nine inch nails. This piece is from Mother Love Bone, song: Capricorn Sister and the line reads “Snake eyed floozy”. 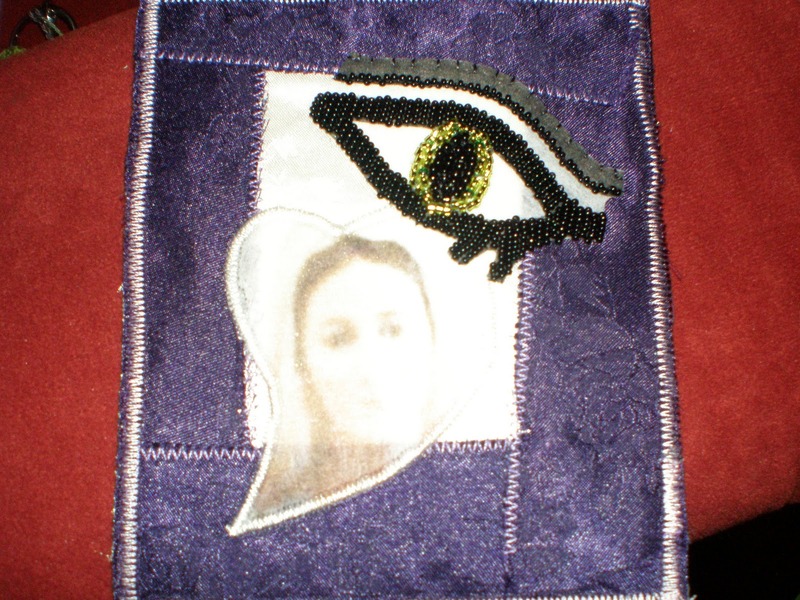 I have printed a picture of Mary (Madonna or Magdalene) and then an eye. 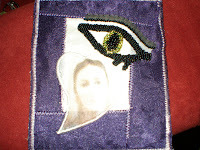 Maree is a fan of eqyptian gods and the eye I have turned into a snake with the addition of beads in a snake shape. Mary Magdalene is regarded as the world’s most famous fallen woman but is also a Madonna figure of the power of redemption. I found this piece quite a challenge as my initial piece had a snake bead on it but it would not sit right and I could not bead around it. I have shown it to Maree and she really liked it so that was great. Starting on the 2011 BJP and I am choosing to do the ATC card size so I can do a swap with Karen (Florida). I have made the backgrounds for January and thoughts to go with it will come on the next posting. I will be using words that mean something to me each month but may also use quotes from other. I am hoping to get my computer sorted as i cannot always download pictures and can never get anything that needs an adobe product. I have been keeping in touch with the BJP'ers and found this via bloghopping on Sue's Craft Cupboard. 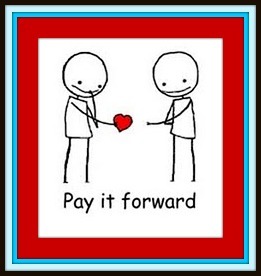 http://tammysprinkle.blogspot.com/ has a Pay It Forward activity. The idea is to promise something handmade to the FIRST 5 people who leave a comment here. To be eligible, you too must repost this offering something handmade by you to 5 other people. The rules are that it must be handmade by you and it must be sent to your 5 people some time in 2011. So - I promise to send the first five people leaving a comment here, a hand-made-by-me gift - soon, but remember you have to do it too. It sounded like a fun thing to do and as I love "snail mail" and "surprises" - and the film "Pay it Forward" - I'm following Tammy's idea too. Thanks for finding my blog - via Anne Marie maybe? Glad you like the idea too. I suppose I count as number one??? I love journals too - and the spontaneous using up of bits ana pieces in a journal is a way of keeping special pieces - I also do ATC's with leftover bits too and postcard sized collage. Yes you do. i am not certain what my hand made treat may be but it will definitely be one of a kind. Hi Diane, could you email me - via the link under my name on this page - giving me your address so I can post something handmade to you - and I'll reply with my address for you. I love New Zealand - spent only 3 weeks there but would love to go back one day.